SEO Myths: Page Size and Keyword Density article updated April 2014. Had a discussion at alt.internet.search-engines (in 2006: time passes so quickly, that’s 8 years ago!) under the thread “Re: Links and PR” with Borek, and put my answer here instead of on the SEO newsgroup (which in 2014 is DEAD other than a Google Groups version). For Google below 101KB and preferably more than a few paragraphs of text so your content includes derivative search phrases (based on the main phrase for the page) for maximum overall related SERPs, beyond that it doesn’t matter. 2014 SEO the 101KB Google limit is no longer an SEO issue, Google indexes significantly more now note: even 101KB of code which didn’t include images was a LOT of text content. In 2014 PageSpeed (how fast a page loads) is important Google SEO wise, so creating enormous content filled webpages is not generally recommended. And that takes us to my latest response (only on this blog). I don’t think I’ve said the above exactly? Pretty sure it was more along the lines that there should be less of the “well known SEO fact” type postings where a few regulars hold a belief, post about it a lot and before you know it, it’s a well known SEO fact. Best example is HTML code validation is important for SEO, where the evidence suggests validation per se is irrelevant, it’s an SEO myth, but on the newsgroup it had been posted so often HTML validation was a ranking factor it had become a well known SEO fact! You’ve made the mistake of assuming I haven’t run SEO tests on this. I create hundreds of SEO tests, so have a lot of SEO research data to work from. Size DOES matter – there is a bell curve with optimal size of the page. When comparing series of pages of identical keyword density, all other things being identical, pages of some particular size are ranked higher. Assuming you did the page size SEO tests, your tests are flawed since you are using keyword density as a variable which you later state there is no optimal keyword density (I’ve got similar results on keyword density tests BTW). If there is no optimal keyword density how can you use it as a standardizing factor in SEO tests to determine the optimal SEO page size? As you later rightly state the more you use a keyword phrase (within reason, guess you aren’t thinking keyword density above even 10%) more likely it is you’ll get a SERP, however as the amount of content increases trying to keep a high keyword density results in spammy content! Going off on a slight tangent here to cover keyword density tools like Squirrly WordPress SEO plugin and SEOPressor WordPress SEO plugin and even Yoast WordPress SEO plugin. WordPress SEO plugins like these have built in keyword density tools, they measure the density of phrases you are targeting. You might think what a useful SEO feature, we can plug in a keyword phrase like “Best Keyword Density” and measure the percentage usage and follow whatever ideal keyword density we believe is best, 0.5%, 1%, 1.5%, 2%, 2.5%, 3%…… You tell me what ideal is? Slight problem with this sort of built in WordPress SEO tool, it only measure the body content, it completely ignores what your theme and plugins are generating AND equally important comments. I don’t check keyword density, so have no idea what the current density of any keyword phrase is for this article. For the sake of SEO analysis let’s say I believe 2% is the perfect keyword density and it shouldn’t go below 1.5% or above 2.5% and when I finish this article I have the phrase “Best Keyword Density” at precisely 2% according to whatever built in WordPress SEO tool I’m using. This was based on a 1,000 word article (I have no idea how many words I used), so to get to 2% I must have used the phrase 20 times (bloody hell, that’s a lot!). It’s perfect right? Wrong, go look at the comments, right now there’s three comments and one of them has the title (the Stallion Responsive theme I use has a feature to give comments titles) “What is the Best Keyword Density?”. Hmm, that covers our targeted phrase, it adds another instance of “Best Keyword Density”. So now we have one too many uses of the phrase, oh wait we haven’t counted the comments text, how many words are within the comments? I have three comments, looks like between them there are ~300 words, should I get the keyword density calculator out and count all text on the page and determine the actual keyword density? OK, so I went to the trouble of measuring the pages entire keyword density and found I’m short one instance of the “Best Keyword Density” phrase, so I add it to the main article. Hmm, what do I do if someone else comments? Should I again get the keyword density calculator out and edit the post again accordingly? As you can see measuring keyword density is fraught with problems. All the WordPress SEO plugins that measure keyword usage in one way or another are useless, there are some very basic soft rules like if you want a SERP add it to the title tag, try to add an image that targets the SERP, use headers (H1-H3), use the phrase as anchor text within outbound links and within inbound links. Really basic SEO techniques that do not require SEO tools to measure keywords densities. What I’ve deduced from this is if all you care about is one keyword phrase, keep the page low on content and with a high keyword density, but if like me you want maximum targeted traffic from long tail SERPs as well ignore keyword density per se (don’t waste your time measuring it) instead make high content pages (like this one you are reading now) and include as many related derivative keyword phrases (SEO synonyms) as possible on the page without going spammy, since one page can obtain more than one SERP. That approach could generate a high 10% keyword density article. 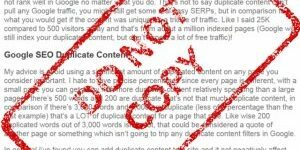 A page with 3,000 words to achieve a high keyword density would require using the phrase SEO Myth 100 times, now that would be difficult and seriously spammy. As I’ve said many times here thousands of low traffic long tail keyword SERPs tend to result in more traffic than a few high traffic SERPs and the traffic is far more stable. Drop a few places with a high traffic SERP (like SEO is a hard competitive SERP) and watch your traffic die over night, do the same with 50% of your low traffic SERPs and you’ll still have enough targeted traffic from the remaining long tail keywords to survive while you gain more traffic. What was a rather shocking discovery for me (reported earlier to the group) the same doesn’t hold for keyword density – there is no optimal KW density, the higher the better. I never tried above 50%, but it just doesn’t make sense. I’ve got similar results (within reason, not talking keyword density of 20%+) and it does make sense if you look at this from the perspective of Google wanting high quality content, not spammy content in it’s index. It’s easy to get a page to above 10% keyword density without going spammy IF there isn’t much content (see earlier SEO Myth example), but try to do the same with a reasonable size page and keeping the keyword density up is impossible without going spammy. So from Google’s perspective when it finds a page with a lot of content and very high keyword density (relatively speaking) it can be reasonably confident it’s a spammy page. This can be incorporated into their search engine ranking algorithm without throwing out too many babies with the bath water. 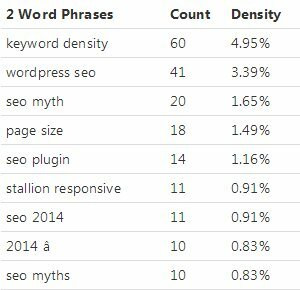 Therefore Keyword Density per se being important to SEO is an SEO Myth, don’t waste your time with keyword density tools. You can see the whole thread from 2006 at Google Groups https://groups.google.com/forum/?hl=en#!topic/alt.internet.search-engines/geLVmLaI7P0. If you wish to make a comment feel free to comment below. 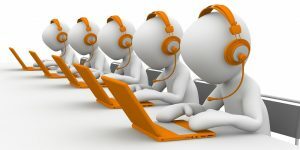 How Many Inbound and Outbound Links for High Ranking? I want to know that with page size and Keyword density, how much inbound and outbound links are good for high ranking. Is there any thumb rule as regards to page size (text only without the html) and keyword density? How much density should be considered good without causing seach engine spam? I am hoping you could help me. I have spent the last few months looking for a really simple link checker tool. I was hoping you would know of one that could help me. Every link check SEO tool and SEO program that I have tried requires that we add a SINGLE DOMAIN and then it verifies that the link is pointing back (reciprocal linking). Thus, I would add a csv containing the link where the url is, the anchor text and the url the link is pointing to and the software would verify that the links are correct. Keyword variation increases natural relevance – I believe that onsite or offsite keywords (titles are links remember) – However, if you go higher in the percentage of exact keyword phrase matches for your whole site, this is bad. If you are low with tangential flirting on the same theme but not exact matches this is good. I think Google has two ideas in their formula, one is yes matches are good (relevance), the second being if the site as a whole has too many pages or post written with exact matches for popular searches (or maybe simply too concise title) in the title (percentage wise) this way it sends a flag you are trying to game the system. The ideas are diametrically opposed on one hand but as a whole it works well for them. My idea (I could very wrong) is not just repetitive but exact keyword matches are bad. That is if you target the phrase “WordPress SEO” This would not be your title (which is link, not because it is not relevant but, it is too exact. I rarely see exact keyword matches rank any more as well as phases. Further I think Google scans a site as a whole and gives it a percentage rank,(maybe I am wrong on this) and if the site is composed of short titles with exact keyword matches on popular searches (like eHow the poster child of Panda) than you get a penalty. It tries to use LSI and natural people writing for the good bucket. If 50% of your site is short titles with exact matches you are not going to rank as high. This is a different idea than Long-tail because spammers try to rank for 2 to 3 word phases, not 5 to 7 word phrases. So I have a theory even though on the relevancy side good will rank a page high if it is short and dense in the title, it will rank the site with a dampening factor if too many are short titles. Varying keywords in links (internal and external) as well as onsite things like H tags in your related post etc keyword phrases is important for SEO because it helps the broad algorithm concept of relevance without being spammy or stuffing. I know I know these things, but on my sites I have not had time to relevant, hence, I believe Google is looking at these sites as more cookie cutter (not good) or keyword repetitive. It is about really using your theme to leverage relevance which in a sense liberates me to simply write in a natural style. I am using thesaurus.com to help stimulate creativity about different ways to express myself. Therefore I have a lot of work to do on my sites which means going back and making it more interesting and natural and using the tools you have given us to make this easier from a structural side.